Remember Disiplin? Vaguely. Which one? I’m sure I remember the Disiplin that released Disiplin, a doom-ridden slice of black metal with guest spots from Faust and Samoth that got rather dull after about ten minutes. And I remember the Disiplin that released Anti-Life, a rocking type of Satyricon-influenced Black Metal with guest spots from Nattefrost that got rather dull after about ten minutes. I also remember the Disiplin that vanished for five years amidst National Socialist-supporting rumours and frantic name changes for frontman Haakon Forwald to Eihwaz IX, Drakul Azacain, General K, Savant M, and Drakul 218. He was in Myrkskog and Dissection for a while, so this is more interesting than you may have thought. Anyways, in case you haven’t guessed, all of the above Disiplins are the same band, and lo and behold, the one true Disiplin are back with two new albums! There’s Hostis Humani Generis on FrentEuropa Records (and with a first track titled Ariosophic Initiation, suggesting that those NSBM rumours may have something to them...) and this, on the underground Italian label ATMF, who I usually expect better from. You see, I have no idea what Hostis Humani Generis sounds like, but for the love of everything, if it’s remotely like this then I really don’t want to hear it. 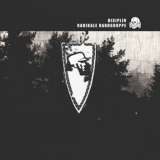 Radikale Randgruppe is the sort of album that gets recorded for a joke by better bands, but Disiplin have decided to go ahead and release this, and god love them, ATMF have agreed. It’s a very raw, dance beat-backed bit of blackened noise that rumbles along with guitars, vocals and electronics all mashed up into one choppy sound. Nuclear Catharsis is mid-paced, Me Ne Frego a little slower, both having a decent sort of vague atmospheric weirdness to them, yet like previous Disiplin albums you’ll be bored stiff within ten minutes. You can imagine my joy upon noticing that I had over an hour of this to wade through, I’m sure. It’s not unbearable or especially extreme, lacking the true harshness of the Wolf Eyes and old Venetian Snares of the world. In some ways this is like a Black Metal remix album that outstays its welcome fast, White Earth especially testing my patience with the drawn-out growls and white noise. I was mildly surprised at how upbeat and cheerful-sounding Triarii is, before the backing electronically-altered screams started and the track got annoying with repetition. Elsewhere in my desperate search for silver linings, the heavy piano plonks that open Oath Of Blood are interesting at first, until they repeat once too often and the surrounding fuzz grows too oppressive. Really, was six minutes of that deemed appropriate? If the band cut each track in half they might have a batch of passable interlude pieces, but as the album stands, over an hour of this is nothing less than painful. When all is said and done, if you preach revolution, then some sort of revolutionary musical style is necessary (a lesson that Blood Revolt have learnt well, as my colleague Charles notes elsewhere this week) unless you’re being deeply ironic, and I very much doubt Disiplin are being ironic. A sad truth is that only in the deeply conservative Black Metal scene could the usage of whooshing noises be revolutionary. Another sad truth is that Disiplin are very late to the party, electronically-enhanced black metal having been putting frowns on corpsepainted faces for nearly fifteen years. It’s as desperate as a press release that waffles about music as a ‘weapon’, as desperate as that Totenkopf on the cover, a band desperately seeking controversy to fill the emptiness left by their music. Do they succeed? No – it’s just boring.